Great in Town Home - Wonderful Light / Beautifully Appointed - extremely comfortable home with designer furnishings. Large Flat Screen TVs, high speed Internet/wifi, 2 Large Brick Fireplaces, large-plank red oak floors. First Floor: Cooks Kitchen, Brick Fireplace, Double Living Room; 4 Bedrooms and 5 Full En Suite Baths. Enclosed Washer/ Dryer Laundry Area. Kitchen overlooks Beautiful Garden and Deck. Small Deck off Living Room with new Grill, Large Deck in Big Backyard next to Children's Koi Pond. Second Floor: Large Sitting Room with Brick Fireplace and Large Bedroom with His and Her Full Baths. Beautiful Willow trees with swing. Walk/Bike to Village, Restaurants, Shops, Library, and Beaches. Top of the line bathroom finishes. Outdoor Shower. Bakery and Coffee Shop just around the corner. Private Parking for 4 cars.1st class living and dining space. 2 New Bikes for use. In-Town Location with Privacy, Seclusion: This wonderfull airy house is located in Town but completely secluded and private - you can sit on the deck , small koi pond adjacent, or dine outside watching the migratory birds and listening to nature's spring and summer sounds in a most beautiful garden setting. 5 minutes to Main St by car or 10 minute walk. Full time Caretaker and Gardener. Nantucket has been our summer place since I was 20 Best place on earth to relax and have family and close friends with you. Wanted a house that provided all which is why we stopped staying at hotels and bought Back Beach. Great interior and exterior space.Terrific furnishings and appliances, great beds and linens all provided. First class living. Caretaker, Housekeeper, Gardener Someone always available if needed. Many of our guests are repeats from previous visits. Back Beach is a house where people return to. A short walk to Main Street, Restaurants, Shopping, Ferries, Museums, Childrens Beach, and Library. Visit the Harbor and view the most magnificent private yachts travelling the world. Every aspect of Resort Living is available on island. Wonderful town with great shops and restaurants. Fully stocked with quality china, crystal and flatware. Daily Housekeeping available if requested. Very nice walk to town. Really 3 bedrooms not 4. 4th is a trundle bed with no closet. Outdoor furniture is dirty, with moldy cushions and some broken chairs. Needs updating. Nice and tranquil yard. Nice welcome package of food and wine. When leaving we had to wash all towels which took close to a day. Also had to pay $100 per person damage deposit when I had damage insurance. Still haven’t heard after 2 weeks whether that check will be torn up. Was sad and surprised to see note from recent guest. I corresponded with her frequently, and the only email I received was "your house is lovely". I have a full time caretaker and housekeeper always available to a guest. It is in my welcome note with gift of wine and food but not contacted other than the email saying house was lovely and a questions about the thermostat. The English trundle bed opens to a FULL BED and there is a closet directly across from bedroom for this room as well as a four drawer dresser in the room and its own full bathroom. Small security check that was paid by guest was returned to guest. Have never had a complaint for our home in the 6 years we have been renting to guests. Guess you can't please eveyone all the time. We just returned home from a great five-night stay and hope to go back someday. The location was great--about a 12-minute walk into town or (in the other direction) Stop and Shop, Downyflake Doughnuts and the Wicked Island Bakery. And the house and yard are both beautiful. 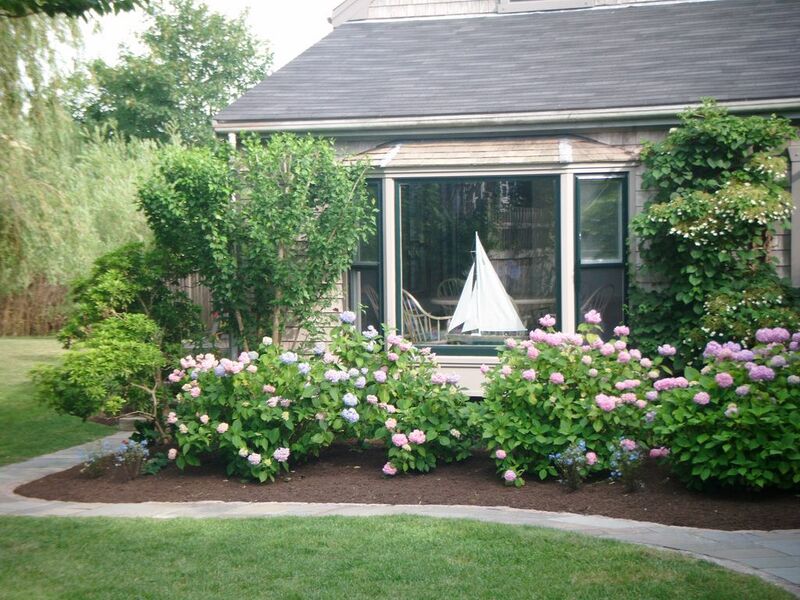 The house is set back from the street so it feels VERY private, and the yard is quite nicely landscaped with hydrangeas, rose of Sharon, roses and more. We enjoyed more than a few pleasant hours just reading on the deck! Three of us biked a lot while the other two (myself and my husband) walked and took "The Wave" bus to and from Sconset. We did rent a car for the last two days to explore the island a bit more. We also appreciated the owner's shopping and dining suggestions--we had a lovely birthday celebration dinner at Straight Wharf and lobster rolls for a late lunch on the wharf at Cru. We loved the house. Owner very easy to talk to. Good location. Classic style house walking distance to town. Peaceful and neat. Back Beach is a beautiful home in a quiet setting in town. It is convenient to shopping and dining and transportation. There is plenty of room to park if you bring a car. The home is well-appointed and spacious. It would be great for a group of friends or families to get together. There is plenty of room in the yard to enjoy the outdoors. The owner was so nice, as well. It is obvious that she loves Back Beach as her family home. I look forward to renting the home again. great house for a memorable stay. This house was better than we anticipated and liked what we saw on Homeaway. We are going to book for next year and have already told the owners. House was very clean, excellent furnishings and most comfortable - didn't need a thing. Our guests told us they had not been to Nantucket before and best vacation they and their family has ever had. They were celebrating their two daughters' birthdays and said our home could not have been a better present. They want to come back next year, hope they do. We are very glad they had such a wonderful time at our home. All who have stayed have sent great reviews and have given this house an Exceptional Rating. This is a private in-town house which is beautifully landscaped, has large garden and outdoor area, is well appointed with Central Air, 4 bedroom/5 full baths and large enclosed out-door shower Is within short walking distance to Ferries, Main Street Shops, Restaurants/Bars, Yacht Harbor, Children's Beach, Brandt Point, Whaling Museum and Library. It is close to everything but extremely private and quiet - large garden with ground level deck and tree swing. 10 minute walk to Main Street. Other Activities: New Bikes for use; great garden level deck for reading and sunning; bakery, health spa, and coffee/expresso shop minutes away. Willow Trees are home to many beautiful birds from golden finches to robbins and humming birds. It is a hidden, quiet spot in town. Private parking for five cars. Security Deposit is paid to owner and short term lease signed for stay. Security Deposit is returned to guest within 30 days if no damage occurs.